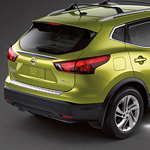 Nissan has long been known as a manufacturer that builds quality vehicles of various types. The focus on a number of aspects that drivers consider important in their chosen vehicle. As such, if you find yourself in need of a compact SUV, then you should give the new Nissan Rogue Sport your full attention. Tackling the roads in the new Rogue Sport is an opportunity to enjoy an SUV that performs well. The core of the Rogue Sport's performance lies with its 2.0L 141 HP cylinder engine. Built for maximum efficiency, this vehicle will keep you on the road and away from the pump with an estimated 32 MPG. An available intelligent all-wheel drive brings even more value to the Nissan Rogue Sport. This system is capable and, in fact, constant monitors road conditions adapting to any and all changes with a speed that is 30 times faster than a human can blink.